HCM City, (VNA) – Ho Chi Minh City should design more effective policies to make full use of the huge brainpower potential of the Overseas Vietnamese community (OV), heard a conference themed “OVs affairs - reality and solutions” held on May 25 in the city. At the event, held by the Ho Chi Minh City’s Committee for Overseas Vietnamese Affairs, Prof. Dr. Dang Luong Mo, a Vietnamese living in Japan held that many activities for OVs have been organised, but they have not been effective in linking the Vietnamese community abroad or tapping their potential to contribute to the development of the city. At the same time, there remain a number of administrative procedures that cause inconvenience to OVs, he said. Currently, Ho Chi Minh City is trying to attract science and technology experts to hi-tech parks, hi-tech agricultural areas, and computer technology and biotechnology centres by offering financial and housing support. According to Dr. Duong Hoa Xo, Vice Director of the Ho Chi Minh City Department of Agriculture and Rural Development and Director of the city’s Bio-technology Centre, this is an “open mechanism” to draw talent to the city. However, the policy is applicable to experts only, he said, pointing to a need to design the “open mechanism” to support science officials, especially young scientists, with a proper income, he said. Meanwhile, Prof. Dr. Vo Van Toi from the US who has engaged in Vietnam’s bio-medicine, held that a more attractive working and living environment, together with competent officials in OV work, are essential to call for overseas Vietnamese’ brainpower. He also suggested three important issues to persuade successful young students abroad to return to their homeland, including a proper salary and promotion opportunities and especially good working conditions. At the same time, Vo Thi Thanh Tuyen, Executive Director of the Vietnamese Business Association in the US, a State agency is needed to gather and promote the strength of Vietnamese businesses and enterprises abroad, helping link them together and supporting domestic counterparts in seeking investment opportunities and developing an integration strategy. Participants at the event also proposed that Ho Chi Minh City should hold regular meetings with different groups of OVs in different fields and markets, thus creating links with businesses at home. 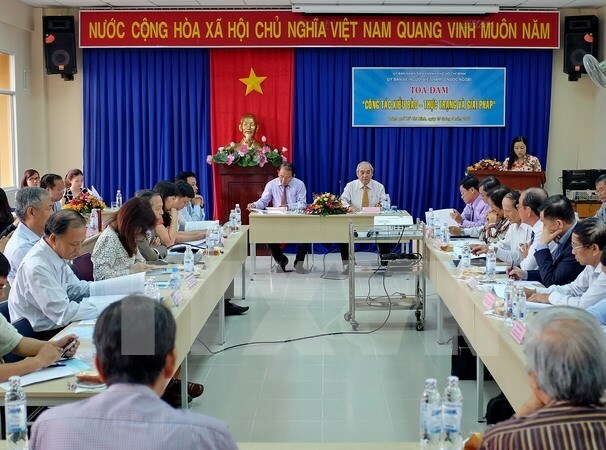 A close coordination is needed between the city’s Committee for Overseas Vietnamese Affairs and related organisations to share information and diversify activities aiming to connect OVs, they said.